Zaatari refugee camp from the air Jump to media player Lyse Doucet reports on Jordan's struggle to reconcile pressure to help even more refugees with the potential risk to its own security. 'Syria could have a political solution' Jump to media player King Abdullah of Jordan tells Lyse Doucet that his country is at "boiling point" as it grapples with the influx of refugees from Syria. King: Jordan must stand together Jump to media player Jordan's King Abdullah has cut short a trip to the US following the killing of pilot Moaz al-Kasasbeh by Islamic State. Huge cuts to food aid for refugees Jump to media player The World Food Programme is being forced to cut aid to vulnerable Syrian refugees in the Middle East. 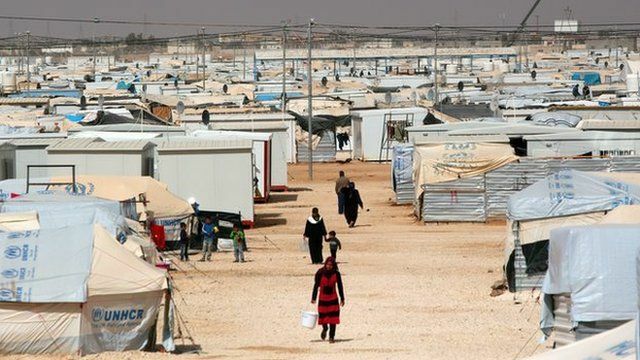 Many of those forced to leave their homes during the Syrian conflict have taken refuge in neighbouring countries, and 80,000 of them are now living in a three-square-mile piece of the desolate Jordanian desert - home to the sprawling Zaatari refugee camp. King Abdullah says his country is at "boiling point" because of the influx of refugees. Chief international correspondent Lyse Doucet reports from Jordan on the scale of the crisis from a helicopter flying over the camp.